Two stories in the Irish Examiner highlight the systemic construction industry problems still faced by consumers despite new regulations introduced in 2014. New Minister Simon Coveney, who plans to double house building output, confirmed that the state has no role in the regulation of construction standards. Yet another defective residential development highlights the continued lack of consumer protection. “There are many similarities between those other developments and what has befallen the owners and residents of Ceol Na Mara in Kill, but above all else, the human emotions are identical. “Who was supposed to be keeping an eye on this when it was built,” a resident told the Irish Examiner. Not for the first time, the trust was misplaced. Regulation of the construction industry was handed over to the business itself in 1990, and — even with changes since some of the problems from the Celtic Tiger were exposed — largely remains so. Minster for Housing Simon Coveney recently confirmed this position when answering a parliamentary question from Waterford TD David Cullinane about Ceol na Mara. That was a stark admission. The State has no function in testing compliance of building regulations. What if the state abdicated testing compliance with financial institutions, or, more pertinently, compliance with road safety laws? How would that be received? 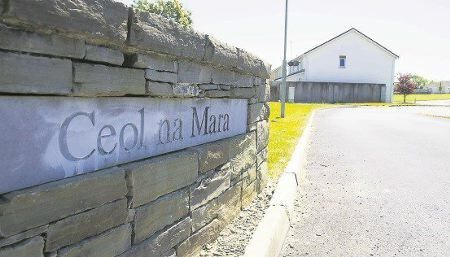 “The Ceol Na Mara estate in the village of Kill was completed in 2008 and is now the latest in a growing list of developments where potentially lethal fire safety defects have been uncovered. This entry was posted in Building Regulations on June 9, 2016 by BRegs Admin. There is something deeply illogical about Minister Coveney’s statement that the State has no function in ensuring compliance with the Building Regulations. As you have correctly pointed out, what if the state abdicated testing compliance with financial institutions, or, more pertinently, compliance with road safety laws? We might add — what if the State left all matters about food safety to food producers? His statement echoes “Reaganomics” at its worst; light-touch regulation, or the absence of regulation, leading to banking collapses, environmental degradation, gross inequality and growing poverty and homelessness, not only in Ireland, but world wide. Clearly, the State has to accept responsibility; and there may even be a case for legal action against the State in an international court for failing to ensure that home owners’ and house dwellers’ health is protected. He does not want to accept responsibility for enforcing compliance as that would mean that more building control officers would have to be employed. How can you expect to enforce the building regulations in a country where there are more dog wardens than building control officers. The title Builder should be protected and given the same status as architect , Q’S , you don’t need certifies once this is done , anyone can call themselves a builder and this where the problem lies. I could see a lot of merit, Martin, on that as an approach. The person best placed to ensure complete compliance, in as far as it is reasonable, is the builder. However, maybe the powers that be think that can never be done. I used think that the licensing system of builders in the US was a good system but then look at the fiasco in California with the balcony collapse. I am in the process of reading the CoP for inspection but it probably also has ‘outs’. You can only inspect a reasonable sample, after all, unless you are full time on site. The Licencing system is an excellent concept and in 2009 when I done my research for my thesis “Qualifications for Builers” I posed a number of questions to various professionals/ trades/ legislators and consumers and one of them was a licensing system which they were in favour off as it identified the individuals trade qualifications and professional qualification. I also asked about protecting the title Builder and again there was agreement as anyone can call themselves a builder. I asked about an independent Building regulator and again all agreed with the concept. I spoke to legislators who regulate the codes and they agreed with all the question i outlined above. The only problem they had was effective enforcement of the building codes which they found difficult and that was in 2009. I am currently doing my masters and i have a very interesting concept on how to ensure compliance. It is a model used quite effectively in another sector and the majority of users adhered to the system. i am researching if it could be used in the construction sector. Very surprising from a Minister who is generally well-thought of. What would be an ideal, no let me say good, system of Building Control as we obviously don’t have it? UK privatisation of the function does not seem to have worked very well. Furthermore what changes would people like to see in for example, the TGDs, to make it easier for the common-gardener builder to be able to use. It has always puzzled why the most expensive financial outlay of our lives is so fraught. Should they be more prescriptive like the old (?) Building By-Laws were?. Should builders be licensed? Nothing Minister Coveney said on this matter recommends him for high office. €15,000 is a relatively small amount when added to a mortgage over 25 years. One concern is that there may be other faults not yet discovered, for example in the areas of cold bridging, condensation, damp and mould. All of these affect running costs and can affect health. Another concern is the lack of knowledge of where liability arises for building defects. The smokescreen of the Amendment Regulations has confused the issue, but back in 2008 the responsibility for building in accordance with the Regulations lay with the builder. Responsibility for taking remedial action rested with both owner and builder. This way game-playing by either could not frustrate a court order. However, even then, the premature winding up of building companies could frustrate a court action, allowing the builder to walk away with his money and leaving the owner out of pocket. This highlights the lack of proper regulation of building companies, who are seldom held properly to account. That is another post for another day. But by far the greatest concern arises from the private buyers. Were these properties inspected by a competent professional? Many chose to avoid this expense on their major life investment. Unwisely, as things turned out. This was the protection that the system of self-regulation offered. This was supposed to be the check and balance to the paper exercise supplied by many builder-developers that masqueraded as an Opinion of Compliance. Without a competent professional inspecting the premises in sale, how could a buyer know the dwelling was compliant? Finger-pointing will not get us a fair and balanced resolution of this matter. People at all levels have to take responsibility for their actions. That is the essence of an ordered, civil society. This starts with the Minister of the day stepping up to the mark and giving leadership. Will we see this kid of leadership from Minister Coveney? Will he deliver on his father’s legacy? I’m hoping to be pleasantly surprised.